Hi. My Name Is Dave and I’m a Running Junkie Because I Hate Running and I Love Running and I Miss Running. While this isn’t #87’s knee, it is what 87 has been doing nightly! As many of you know, I’ve been running for over a year now, thanks in part to the Couch to 5K trend that my friend Angela tricked me into doing in 2012. OK, to be completely fair, she didn’t really trick me into it. I just didn’t expect to do more than that 5k last year. You see, that 5K turned into more 5K’s and into a few 10k’s, one 8k, one 5 mile leg in a team marathon and now into preparations for my first half-marathon in Grand Rapids in October. And as I started my training in July, I really was geeked for this next adventure. Despite telling myself, over and over and over again that I’m not a distance runner, I keep going and wanting to go more. I just can’t put into words the peace that I often find right around the third mile of a run (regardless if it is a 5k or longer). The peace I used to find shooting things on the PS3/Wii I no longer find. I find that tackling Nichols Road and the KRVT. Last Saturday, I went for my longest run ever, just over 10.5 miles. It wasn’t my best time, didn’t have a lot of speed behind me … but I’m proud of it. I remember thinking about halfway through that I felt great and had finally lost my doubts about being able to go 13.1. I remember thinking that my training plan was going to have me run 11 miles this upcoming Saturday, 12 miles the following Saturday, and 13 two weeks from now. I think at one point, between the drops of sweat falling down on my glasses, that I had a smile on my face. Then I got to the intersection of Nichols and Ravine. There’s a bench at the intersection. I reached it and I sat down … for about ten minutes. My knee was fine as I sat and it was fine when I stretched it out and when I stood up. My knee has been a little sore for the past few weeks, but nothing that would keep me from running. It was more of a nuisance than something more serious. And as I resumed my run, it seemed fine … and so up Nichols Hill I went. I was OK all the way to the entrance of my subdivision. When I got home, the same thing that made my knee yell at me 2.2 miles before … something sharp and right behind my knee cap introduced itself and it didn’t really say any kind words. Frankly, I don’t think I gave it any kind words back. I haven’t been able to run since then. 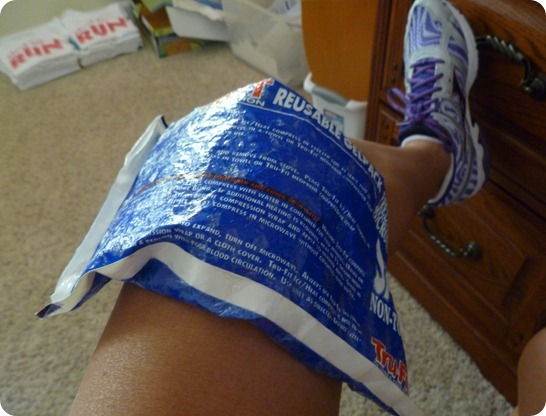 I’ve iced my knee multiple times during the days since then, and at times it seems fine. At other times it almost keeps me from being able to shift my car from 2nd to 3rd gear. This morning, as I walked from the parking lot to my office building, it joined me while I walked a normal pace. This is the first time that I’ve noticed it when I walked … and now I’m worried. I’m worried that, like Jim Lovell, I’ve lost the moon. I’m worried that I won’t be able to make it back for my half-marathon. And beyond that, I’m worried that I won’t be able to run again. I hate the pain that I’m in. I hate the soreness I had a few weeks ago. And if I can’t run again, I will hate the fact that I’m not running. I have a regular check-up scheduled with my doctor in two weeks and I should get a referral to a knee specialist at that time. I just pray that it’s not going to be too late and that I can still get my 13.1. But more importantly, I pray that they don’t take my running away from me … that would just crush me. It’s only been four days since my last run and mentally I’m just not in a good place. And if this is what I’m going to be like after four days of not running, what the hell am I going to be like if I can’t run anymore. I guess I’m a running junkie. Previous Previous post: Wesley Crusher said “Be Awesome” So “Make It So”! May your knee heal quickly. Had this myself and it sucked. But it did heal up and haven’t had it again since.